Crunchy wafer and soft praline filling that melts in your mouth and lifts your senses up. Delicious combination of real chocolate and scrumptious caramel cream which offers a pleasant surprise and carries you along to new tasty experiences. Dark chocolate that satisfies even the most demanding lovers of sophisticated tastes. These are Caprice! They provoke you to enjoy them and live their unique taste. 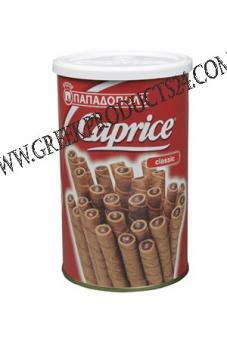 --------------------------------------------------------------------------------------------------------------------------------------------------------------------------------------- Papadopoulos Caprice offer you wonderful taste and of course the incomparable Papadopoulos quality. Caprice with hazelnut and cocoa cream filling made their first appearance in 1978. Ever since, the range has been enriched with new flavors that cover all tastes and needs of consumers. It is the company’s main exported product- it is exported to all 5 continents- and its daily production is so big that if we placed the small wafers the one next to the other, the line they would form would be more that 250 kilometers long, a distance equal to 625 times round the Olympic Stadium! 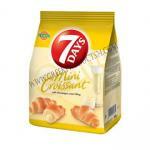 Caprice are available in packages of 400g, 250g and 115g, to enjoy them any time. A product with a long history, a recipe loved like no other, an adoration that brings Caprice first in your preferences. --------------------------------------------------------------------------------------------------------------------------------------------------------------------------------------- Caprice: tasre it, share it, love it! You can now enjoy your favorite Caprice frozen too! How? It’s simple! You can put them in your freezer! The crunchy sensation of the waffle and the frozen chocolate will enchant you! Try it NOW!